TH Properties and the developers will build super size luxury bungalows, each standing on 0.4ha, marketed under Malaysia My Second Home. TH Properties Sdn Bhd will launch by mid-2010, two luxury housing projects worth RM1 billion at its 2,046ha freehold Bandar Enstek development in Nilai, Negri Sembilan, in a joint venture with developers from India. Zaharuddin told Business Times that they will build super size luxury bungalows, each standing on 0.4ha, marketed under Malaysia My Second Home. He added that the bungalows would be sold to high networth individuals from India, the Middle East and Singapore. It is learnt that each bungalow will sell for around RM5 million. "We can't reveal more details as the agreement is still being finalised. We hope to sign it next month. The developers are preparing the master plan for approval," Zaharuddin said. "In terms of development value, the Indian partnership will be our biggest investment from overseas into Bandar Enstek." Zaharuddin said TH-NSTC Sdn Bhd, the developer for Bandar Enstek had been approached by the developers at the start of the current year and initial talks have led to the signing of a memorandum of understanding in March. He said TH-NSTC is open to similar JVs with local and foreign developers but they should be able to add value to the township and bring in their own market catchment. "We will consider allocating land to them to develop but we will be cautious in our approach. We rather do it ourselves while we can," Zaharuddin said. TH-NSTC is a 70:30 venture between TH Properties, the property development arm of Lembaga Tabung Haji, and the Negeri Sembilan State Development Corporation, respectively. The project is 30 per cent developed with 1,200 units of single and double-storey terraced hou-ses, bungalows and semi-detach-ed houses built and occupied. The entire development will feature residential, industrial, commercial and institutional components with properties worth RM9.2 billion. The project is scheduled to be completed in 2025. PETALING JAYA: Sunrise Bhd’s results for its current financial year will be supported by its unbilled sales of about RM1bil but the tough outlook for the luxury property market in the Klang Valley will continue to be a threat. According to OSK Research, Sunrise’s unbilled sales stood at RM1.01bil as at July with a potential addition of RM157.1mil pending the signing of sale and purchase agreements. The research house said the company was expected to continue to register commendable earnings growth for most of its financial year ending June 30, 2010 (FY10) supported by its high unbilled sales. However, the outlook for the Klang Valley luxury condominium market would continue to be tough until some time next year. It said developers’ claims of better property sales from recent launches should not be misconstrued as a sign of recovery as it was achieved via various discounts and innovative loan packages. “This can cut into a developer’s earnings margin and such incentives cannot last indefinitely,” it said. OSK Research viewed that Sunrise’s management sentiment was one of cautious optimism with the belief that the worst was indeed over for the sector. “Being cautious, however, the management remains uncommitted to any timing and pricing of its future launches,” the research house said. Meanwhile, AmResearch acknowledged that Sunrise would continue to recognise profits from its strong unbilled sales for FY10 onwards. Its unsold inventories had dropped to about RM200mil as at June versus RM300 to RM400mil in the preceding quarter. “We feel Sunrise will step up its plans for new launches especially for MK28 and Solaris Towers KL, which have been granted all the necessary approvals,” the research house said. For its overseas projects, AmResearch said the management was still cautious in launching overseas projects. Its project in Canada, which has a gross development value of RM1.2bil, would be launched in two phases three years apart. Sunrise posted a net profit of RM43.1mil for the fourth quarter ended June 30 against RM44.9mil a year ago. Its revenue stood at RM237.3mil. For FY09, it reported a net profit of RM156.2mil on a 17% growth in revenue to RM803.9mil. OSK Research said the growth for FY09 was driven by higher earnings contribution from its property projects that included MK10, Dutamas, Maiden, MK11 and the Residence. “Since the introduction of the 10/90 financing scheme and two-year deferred payment for buyers, new property sales indeed picked up in the fourth quarter, particularly for the MK11 and the Residence,” the research house said. HwangDBS Vickers Research said Sunrise’s net profit for the fourth quarter was within its expectations. “Its net gearing rose to 46% from 38% in the third quarter due to funding for on-going projects but it is expected to improve with unbilled sales,” it said. HwangDBS raised the company’s earning estimates by 37% to RM148mil after taking into account stronger take-up rates for upcoming launches. 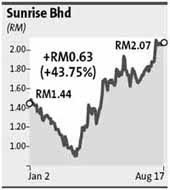 “Consequently, we raised the target price to RM2.60 from RM2.10 based on 30% discount to revised net asset value of RM3.77 and maintain our ‘buy’ call,” it said. AmResearch revised Sunrise’s earnings estimates to RM174mil and RM177mil for FY10 and FY11 respectively, in view of the expected launches for its MK28 and Solaris Towers. It forecast the company’s FY12’s earnings at RM178.3mil. The research house also expected Sunrise’s gearing to improve to 34% in FY10 and 22% in FY11. IRIS Corp Bhd and Mapletree Industrial Fund Ltd have agreed to extend the deal to sell two plots of land with a building at Technology Park Malaysia. The parties now agreed that negotiations to seal the sale and purchase agreement of the land and a four-and-a-half storey block be extended to November 18 this year from August 19 originally. According to the plan first announced in 2007, Iris would sell the land to Mapletree before leasing them back. SUBANG SkyPark Sdn Bhd is confident of recording RM6 million to RM7 million in revenue from its refurbished Skypark Subang Terminal (SST), formerly known as Terminal 3, by May next year. Executive director Tan Sri Ravindran Menon said the city airport operator was confident of achieving its target with the completion of works at SST by October this year. "The RM40 million terminal is 90 per cent completed and destined to become Malaysia's premier airport in the city," he said at a media sneak preview of the SST in Petaling Jaya, Selangor yesterday. When fully operational, the SST is able to accommodate an average of 60 flights daily, comprising of local and regional arrivals and departures, he said. Presently, Berjaya Air and Firefly are using the terminal for international and domestic flights. The 150,000-square foot SST is expected to handle 2.5 million passengers by end of this year, Ravindran said. Currently, passenger numbers are peaking at 60,000 a month, he said. The company is involved in the RM300 million redevelopment plan for the Subang airport, consisting of RM40 million for phase one, RM110 million for phase two and RM150 million for phase three. Ravindran said the three phases included a city airport for turbo-prop aircraft, fixed base operations for business jets, and maintenance, repair and overhaul facilities. The three phases are scheduled for full completion by end-2011, he said.